I read a story the other day about how automakers have finally axed putting cassette players in new vehicles. Lexus was the final brand to do so and that went away with the announcement of the SC430 being discontinued. As I look around my office area here at home I am reminded of other technology gone the way of the Dodo bird. Nearby sits an old 8-track tape and in the other room is a “stack of wax” as DJs of days gone by described them. LPs. Long-Playing Records. This past Christmas I bought a USB-powered turntable to turn some of those “golden oldie” recordings into digital music. And today I was inspired. OK, bored, but eventually inspired. The new Ford Mustang I am testing this week features the latest SYNC technology so I wonder if this USB turntable would work in the car? On my first try of connecting the device directly to the SYNC USB port failed. The turntable needs the included software to “translate” whatever is spinning at 45 or 33 1/3 revs per minute into a digital signal. Hmmm. OK, install software on my MacBook, connect turntable, load vinyl album, launch software and – success, so far. 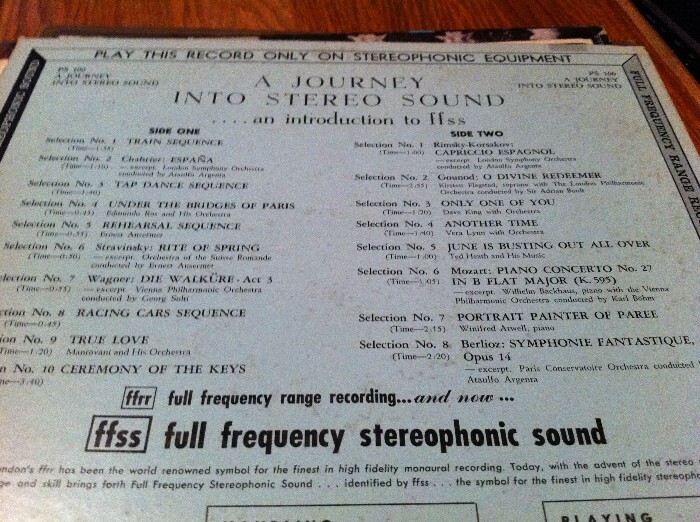 The album I purchased at a church rummage sale a couple of years ago predates WWII and is a promotional piece that introduces consumers to the wonderful world of stereophonic sound – Full Frequency Stereophonic Sound as it was known back then. 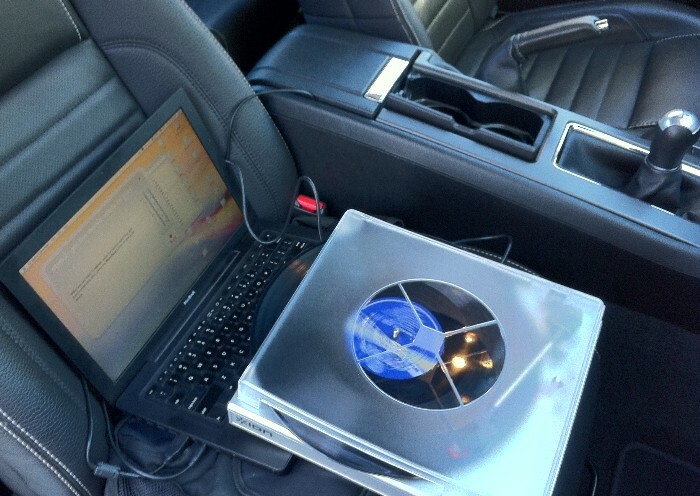 So how do I introduce this newfangled type recording into my newfangled Mustang? Simple. I take a small technological step backwards and connect a mini-plug cable from the headphone output on my laptop to the input jack at the SYNC terminal that is next to the USB port. Voila. 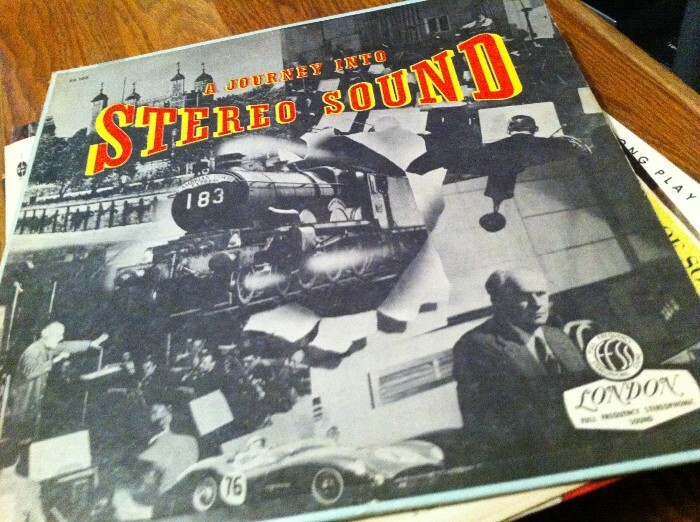 Geofrey Sumner’s golden English voice is playing through the Shaker 500 stereo system in the pony car. Watch it, a train is passing by left to right, followed by a symphonic demonstration of Chabrier’s “Espana” in full (albeit neophyte) stereo wonder. Well, with that accomplishment I wondered how I could push this to the next level. Ah yes, a driving demonstration, and in a 412hp musclecar with a six-speed manual gearbox. Nice. Sure, the record skipped every time I hit a bump and yes, slap-shifting launches are no friend of this old-fangled technology but hey, on a smooth stretch of asphalt I experienced Stravinsky’s (appropriate) “Rite of Spring” the way it was originally recorded during a performance by the Orchestra of the Suisse Romande conducted by Ernest Ansermet.